Security and firefighting forces extinguish 5 fires caused by terrorists from the Gaza Strip. Incendiary kites and balloons launched from the Gaza Strip continued to cause fires in the south Tuesday. Security, fire and rescue forces have identified at least ten fire centers in and around the Gaza perimeter communities so far today. The southern district of the fire and rescue services announced that at least seven fires had broken out as a result of incendiary balloons. 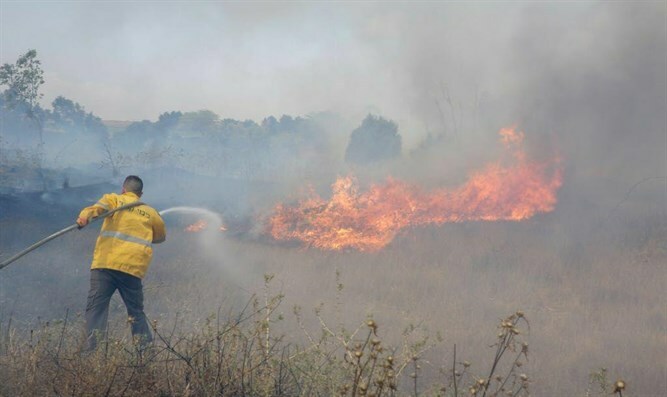 Southern firefighters in the firefighting and rescue services, together with the IDF, KKL-JNF and the Nature and Parks Authority, succeeded in extinguishing five of the fires. Now the firefighting forces are still dealing with the fire raging in three places in the Gevim Forest. Infections also broke out in Dorot Forest and the Sapir Forest (near the college). KKL-JNF personnel, firefighting and rescue teams and firefighting aircraft operate in the area. Last night, Molotov cocktail had been fired from the Gaza Strip reached the city of Be'er Sheva for the first time. The balloon carrying the firebomb traveled about 25 miles and landed near a hospital. The police sappers were alerted to Ringelblum Street in the city's D neighborhood following the landing of a balloon to which a suspicious object was attached. Police forces on the street closed the street until the device was removed.